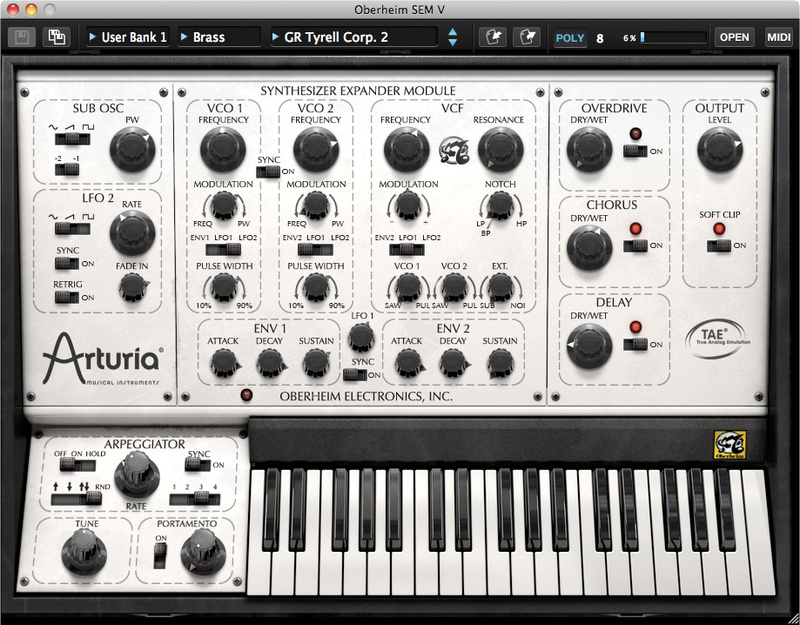 Tom Oberheim's classic two-voice synth gets the Arturia treatment in the form of the SEM V.
Introduced in 1974, the Oberheim SEM (Synthesizer Expansion Module) was developed as an addition to a keyboard synth or a sequencer, not as an instrument in its own right. Nevertheless, it wasn't long before people realised that one or more SEMs could be combined with their own keyboards to create self-contained synthesizers. The SEM's popularity, in turn, inspired the birth of the 4-Voice, in 1975. This was a wonderful instrument; each voice was generated by an independent synth module, and the ensemble had amazing depth when you could get it to stay in tune with itself. Inevitably, the 4-Voice was followed by the 8-Voice. There were three versions of this, two of which were dual-manual monsters with eight SEMs mounted in the lids of their huge cases. While programming and playing these was often impractical, players who owned them would rarely (if ever) say a bad word about them, and they remain desirable to this day. Nonetheless, the 8-Voice was soon superseded by the first of the OB series, the OBX, which, together with the Prophet 5, ensured that the era of the SEM was over... except that it wasn't. Vintage SEMs remained objects of desire for the next three decades, and a couple of years ago Tom Oberheim announced that he was going to start manufacturing them again. In September 2010, I reviewed the MIDI version in Sound On Sound, and I was impressed. Meanwhile, on this side of the pond, the chaps at Arturia were working on a 'soft' emulation of the SEM that could be used as a monosynth or duosynth, as a 4-Voice or 8-Voice emulator (with all the vagaries and inconsistencies that that implies), and as a modern polysynth with a maximum of 32 voices. Now it's arrived. It's the SEM V.
The SEM V with its top panel revealed. An SEM V patch is based on the same dual-oscillator architecture as the original, with sawtooth and variable-width pulse waves, frequency modulation and PW modulation, as well as oscillator sync. Likewise, the 12dB/octave state-variable filter offers the same BP/LP/BR/HP options as before, with seamless transitions from low-pass to band reject (notch) to high-pass modes, and both positive and negative modulation of the cut-off frequency. The simple sine-wave LFO is also retained (although it now boasts host synchronisation) as are the dual ADSD contour generators with ENV1 hard-routed to the VCA and assignable to VCO1, and ENV2 assignable to VCO2 and/or the filter. Amazingly, the last paragraph is an almost complete description of a vintage SEM, so everything else within the SEM V is an enhancement. Most obviously, to the left of the central panel in the GUI, there's a second LFO, this time with three waveforms, host sync, key retriggering, and fade in, and you can route this to either or both VCOs, as well as the filter. It may seem a small improvement, but having independent control over, say, VCO1 vibrato and VCO2 PWM makes it possible to create all manner of lush sounds that were unavailable on the original. However, unlike LFO1 (which is generated independently for each voice), LFO2 is monophonic, and therefore modulates its destinations identically in every voice. This means that it's not suitable for generating effects such as independent panning and sweeping of voices, but it's ideal for things such as tremolo. Above LFO2, there's a sub-oscillator that offers three waveforms (sine, sawtooth and variable-width pulse) and can be placed either one or two octaves below the pitch of VCO1, and this is injected into the signal path where the external signal #1 input lies on the original. Replacing the external signal #2 input, there's a white-noise generator, which is also a welcome addition. In truth, the omission of the external signal inputs is no great loss. There are myriad other ways to filter, chop up, overdrive, chorus and delay sounds, and I'm not going to shed any tears because the SEM V isn't one of them. To the left of the GUI's keyboard lie two more facilities found on Oberheim synths based on SEMs, but not on the SEMs themselves. These are a master tuning knob and a portamento function, neither of which require further discussion here. However, next to these, the monophonic arpeggiator deserves mention. This offers the usual four modes (up, down, up/down and random), up to four octaves' range, a hold function, and host sync so that you can lock the arpeggio to the tempo of the track and anything else going on within it. There's nothing sophisticated about this, but the sounds generated by an SEM are often eminently arpeggiable (if there is such a word), so the results can be very pleasing. Offsetting the VCF cutoff frequencies of eight virtual 'voice boards'. So far, everything I've described lies in plain view when you launch the SEM V but, in common with Arturia's other soft synths, it has a pop-up panel above the imitative GUI, and it's here that the synth really begins to excite, particularly with its ability to emulate the original 4-Voice and 8-Voices. It's hard to describe how these sound different from other polysynths. Hackneyed words such as 'organic', 'deep' and 'involving' don't quite do the job, so I'll fall back on a more human description: they're a choir of monosynths. If you add a second (or third, or fourth...) voice to an existing note or chord, the effect is not merely a doubling, tripling or quadrupling of the same sound, but an invocation of a new voice. Sometimes the inconsistencies between these voices can be a right royal pain, but when one of these instruments is played to its strengths, the results can be fabulous. To emulate this, the SEM V provides an '8-Voice Programmer' which allows you to determine offsets for your choice of up to six out of 24 possible parameters, thus approximating the inconsistencies of the SEMs in the original synths. 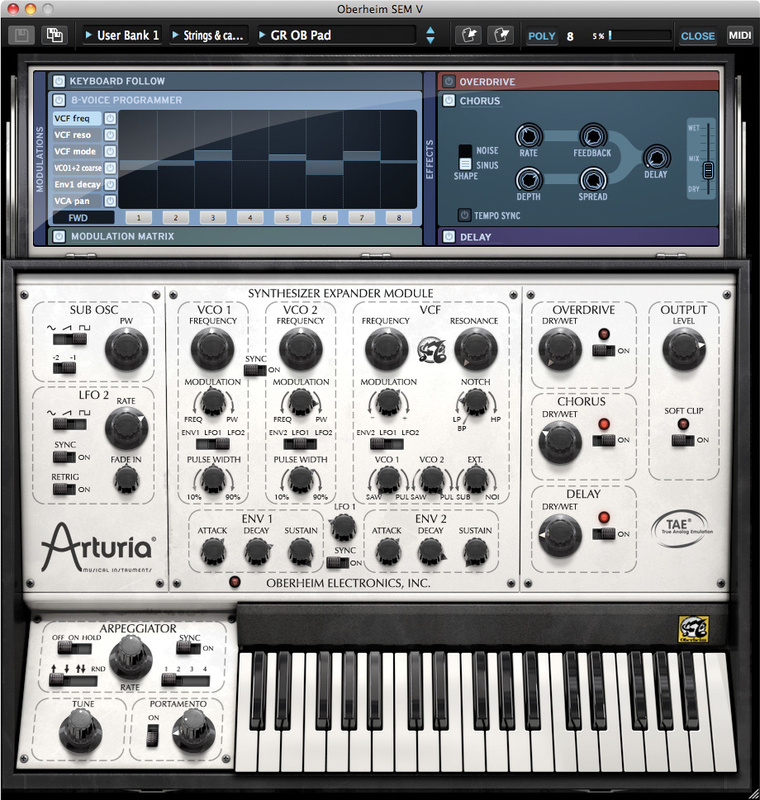 You can also select how many virtual 'voice boards' (between one and eight) are used, this allowing you to imitate Oberheim's 2-, 4- and 8-Voice configurations, and you can select from six voice-allocation modes — forward, random, reassign, and so on — to determine how the synth selects the voices as you play. The results can be superb, although, as I later discovered, the size of the offsets necessary to emulate the vagaries of the vintage synths come as some surprise. Looking to modern synthesis as well as to the past, the SEM V also provides a modulation matrix with eight bipolar slots, each offering eight sources and 26 destinations. While these considerably enhance the synth's internal modulation capabilities, its performance capabilities are increased even further, thanks to the inclusion of velocity, aftertouch, the pitch-bend wheel and the mod wheel as sources. Despite the somewhat stoic nature of its inspiration, the SEM V can be a truly expressive synthesizer. The last of the additional programming sections offers six (from a list of 24) simultaneous destinations for keyboard follow. You can activate each of these independently, and program them independently with curves as simple or as complex as you choose. Anchor points are easily added, moved and deleted, and you can determine whether the curves between them conform to linear, exponential (positive) or exponential (negative) profiles. Think of this as a modulation matrix with a single source (the note number) and six programmable destinations, and you won't go far wrong. Of course, you can use key follow to determine attributes such as the brightness or modulation speed of a note on many other synths, but the system on the SEM V is so quick and intuitive that it just begs you to be creative. Next, we come to the SEM V's three effects units: overdrive, chorus and delay. The Oberheim-y front panel allows you to control only the on/off status and the dry/wet ratio of each of these, and you access the detailed controls using three further windows in the pop-up panel. As you would expect, the overdrive is straightforward, offering controls for the drive level and the high-frequency content of the resulting distortion, but nothing more. 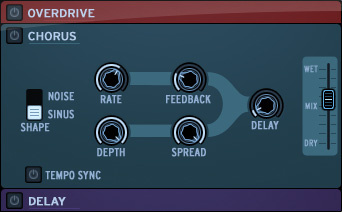 By contrast, the chorus offers control over the delay time, rate (with host sync if required), sine/noise waveforms, depth, feedback and stereo spread. Finally, the delay offers independent delay times (again with host sync) and feedback levels for the left and right channels, high frequency damping, and ping-pong. It might be tempting to dismiss these effects as overly simple, but they do a useful job with a minimum of fuss. In the days before digital signal processors, most of us played our keyboards through a chorus pedal or phaser, followed by a Space Echo and a valve amp/speaker combo of some sort... Which brings us to the final element in the signal chain, which is an overdriveable output-level control with a 'soft clip' option. Every so often, one encounters a design that, like baby bear's porridge, is just right. The SEM was one of these. It was a very limited synthesizer, but what it did, it did very well. I was therefore delighted to find that the look and feel of the SEM V takes us right back to 1975. But let's not prevaricate; what you want to know is, does it sound like a genuine SEM? Throughout this review, I had it running alongside a modern MIDI SEM from tomoberheim.com, as well as my large, heavy, idiosyncratic and unwieldy 4-Voice, so I can answer with confidence... yes, the SEM V can sound like an SEM. Of course, its filter characteristics ensure that it's always going to sound more like an Oberheim than, say, a Moog or an ARP, but when you ignore 75 percent of what it offers, set it up like the original synth, and play it appropriately, there's something clearly OB-like about the SEM V.
To verify this, I created some simple, low-pass filtered, monophonic lead sounds on the modern SEM. Then I recreated them on the SEM V. On every occasion, it took just moments to obtain something very close. I was playing both synths from an Arturia AEL keyboard (using the USB port to control the soft synth and the five-pin DIN output to control the SEM) and as I jumped from one instrument to the other by punching the mute buttons on my desk, I often lost track of which sound was emanating from which synth. The sounds were always identical, but it wasn't possible to say that 'this is the SEM' or 'this is the soft synth' with any confidence. Interesting key-follow curves are but a few clicks away.Inevitably, the differences became more evident as the complexity of the patches increased, and I have to admit that I then found it quite time-consuming to get the patches to respond in the same ways. But the differences became obvious when I created a polyphonic patch on my 4-Voice and tried to recreate it on the SEM V. This was not because the sounds generated by the soft synth and the individual SEMs were greatly different, but because the inconsistencies of the vintage SEMs were much greater than I had expected. So I ditched my preconceptions and started entering much larger values into the 8-Voice Programmer, whereupon the SEM V again started to become reminiscent of the original. Of course, the SEM V can do more than emulate early polysynths, and stepping through the factory sounds demonstrated a much wider range of capabilities. The supplied library is huge, and if you're a programming novice, you could do worse than to work your way through these patches to see how they do what they do. The families of sounds covered in depth include lead synths, basses, pads and effects, as well as arpeggios and short sequences (see the 'Faux Sequencing' box). However, there are at least three types of sound that are under-represented in the library. The first is pianos, but this comes as no surprise because I've never heard a decent (or even half-decent) piano sound emanate from an SEM. The second and third are strings and brass instruments, which seems a bit odd, given that the SEM V is so capable in these areas. Inevitably, given that I was initially testing v1.0, and later v1.1, there were a few niggles during the course of the review. For example, the Key Follow screen doesn't show the full width of the keyboard, so you have to scroll left and right to set it up fully, which is daft. Sonically, there were a couple of oddities, too, such as the glitches that occurred with the overdrive set to maximum, with maximum damping, and I also found that the stand-alone version of the SEM V was prone to glitching on my Mac, even when the processor load percentage was in single figures. This behaviour did not seem present when the synth was run as a VST or AU plug-in in Plogue Bidule, but in this environment there were other issues, such as its unwillingness to run the VST and AU versions simultaneously. To be fair, I don't expect these to be insurmountable problems, but there are a few bugs to be ironed out before we can be confident that the SEM V will be rock-solid in every environment. Finally, I found some errors in the documentation. This is not a matter of Franglais, because Arturia's manuals tend to be good in this respect. But whoever cut and pasted the sentence, "With a very high resonance level, the filter will begin to self-oscillate, creating sound which is close to a sine wave” from one of the company's other manuals should hang his (or her) head in shame. (The SEM filter doesn't self-oscillate, and neither does the SEM V's.) Likewise, notwithstanding the spelling errors, the statement, "Oberhime SEM doesn't have LFO modulation for the VCA, so the Oberheim Sem-V doesn't either” is also wrong. (The SEM doesn't, but the SEM V does, via the modulation matrix.) A proof-read and a reprint are in order. The effects window with the chorus exposed. If you've been lusting after the classic Oberheim polysynth sound for the past 30 years, there has been no alternative to hunting down a huge, heavy, hyper-expensive and potentially unreliable vintage synth. Consequently, I'm amazed at how long it has taken for a 'soft' imitation to appear. But now it's here, it does what it says on the box, and I like it a lot. Sure, it won't be the product of choice for players who want a single, all-encompassing soft synth. The original SEM did just a few things very well and, while the SEM V stretches its boundaries considerably, you can't expect it to produce the ranges of sounds that you can obtain from soft synths based upon Odysseys and OSCars, let alone ARP2600s and VCS3s. Nonetheless, it will be an excellent complement to other synths and soft synths — beautifully simple to use in the first instance, while offering greater depth when you're ready to take advantage of it. Oh yes, and then there's that sound! There are numerous species in the genus 'revered vintage monosynth becomes virtual polyphonic soft synth with lots of extras and effects bolted on'. 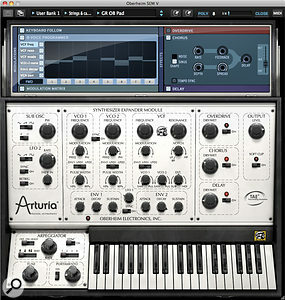 Arturia's other offerings in this area include the Minimoog V, Moog Modular V and ARP2600 V, while their local neighbours, XILS-Lab, entered the field with the innovative XILS-3, which was inspired by the EMS VCS3. In the UK, GForce recreated the OSCar, recently updating their impressive ImpOSCar to V2 status while, in the Far East, Korg reinvented their own MS20 for inclusion in the Legacy Collection. None of these are turkeys — indeed, all are capable of superb synthesis and sound quality — so your choice will probably be determined by taste rather than by any objective measure of superiority. Clicking on the MIDI button in the top right‑hand corner of the SEM V's interface turns all the knobs and switches an interesting shade of purple (for parameters yet to be assigned to a MIDI CC) or red (for those that have already been assigned). Thanks to the clarity of the GUI, assigning the whole panel takes just a couple of minutes, after which — with a suitable MIDI controller — the SEM V feels even more like an old analogue synth. 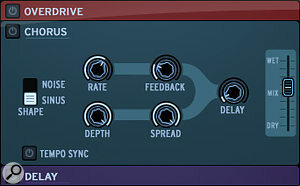 The current breed of hardware SEM doesn't offer the MIDI overflow function that would allow users to connect multiple units for use as a polysynth. However, the Oberheim SO4V (Son Of 4-Voice) is due later this year, and this will combine four SEMs with a degree of programmability, plus the ability to cascade two units — with a projected cost of a hair under US$7000 — into a genuine Oberheim 8-Voice. But until that appears, the SEM V is the only contemporary way to obtain the 'Oberheim sound' polyphonically. There's no sequencer within the SEM V, but if you set up the pitch, filter frequency and other offsets in the 8-Voice programmer appropriately and then arpeggiate the result, you'll find that you have a very well‑specified eight-step analogue-style sequencer at your disposal. Combine these sounds with synchronised modulations and delay effects, and all manner of sequences and rhythmic sounds leap forth. A clear, simple and expressive synthesizer. It can sound very similar to the iconic synths on which it's based. It's an excellent complement to other soft synths. It's much more manageable than an original 4-Voice or 8-Voice! Like its inspiration, its voicing is more limited than many other synths. There are still a few bugs to be ironed out. The manual needs tidying up. There's something a bit special about vintage Oberheim synths, and the SEM V captures this well. If you like the Oberheim sound but don't fancy investing thousands in a 30-something-year-old lump of hardware, you would be negligent if you didn't check this out. Apple MacBook Pro 2.6GHz Intel Core 2 Duo, 4GB RAM, OS 10.6.8. 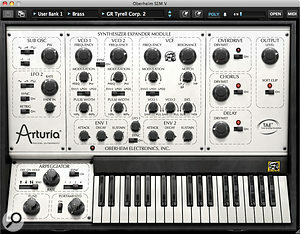 Arturia SEM V versions 1.0 and 1.1.